For all the stances karate students are required to learn - and there are many - most trainees adopt only one or two for sparring. A real popular one is the side-stance (kiba-dachi) that positions you perpendicular to your opponent. This is favorable as it takes the body out of the direction of most strikes. The problem with this stance is that launching anything with the rear leg or reverse hand is compromised. The most common one I've seen (and use myself) is seisan-dachi 'to-the-oblique' or simply a general fighting stance. This is akin to what boxers use. One instructor I had used to teach an interesting way to get into one's natural fighting stance: jump in the air, turn the body slightly, and land with the corresponding foot forward. If that sounds a bit convoluted, just try standing feet shoulder width apart, and turn your body at about a 45 degree angle with one foot leading. Hold your hands at chin level with forearms vertical and bend your knees slightly, and you have a good fighting posture (kamae). Some schools emphasize long, wide stances with chambered punches held at bay. Good for developing form and stamina and such, but for sparring these are not practical techniques to use. 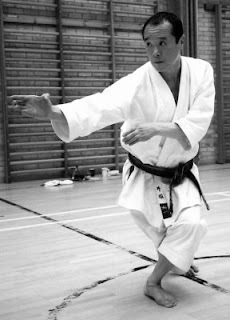 Shiko-dachi (wide parallel stance) works well in certain self-defense scenarios, but would be useless in a point-match. Koza-dachi (see photo) like some other "odd" stances are actually transitory maneuvers in a broader fighting scheme. According to Seiyu Oyata of Okinawan te lineage, the koza stance could actually be utilized as a leg trap for the opponent. This exemplifies how some of karate's applications have been lost or misunderstood through the years, especially when comparing close-quarter self defense moves against the longer range techniques of sparring. In sparring you want to be grounded, yet mobile when necessary. A certain amount of movement is essential; not too much or the wrong kind, though. Some fighters like to bounce, and for the life of me I don't know how anyone can get anything off when you're hopping up and down like that. If you like gimmicks, you could always perfect the now-infamous one-legged Crane stance that Daniel-san used to save the day at the end of The Karate Kid. Otherwise, if you have a special stance or kamae that you like or feel that's useful, please share your knowledge. Hi there, RSS subscriber, first time commenter. I did two months of shorinji kempo in Tokyo last year (I do Wado Ryu normally) and they tend to use a neko ashi stance both for kihon and kumite. It's a fast but defensive stance and I have to say I've found myself leaning that way when sparring now! Like your blog - thanks for sharing your wisdom. Excellent post. In sparring, my goal is 45 degrees but often I end up facing too far front. You have me thinking about the koza. Some of the applications we use for the koza are: transitional stepping, leg hooks, and kicks to the knee. Next class...we will be working on a leg trap. Thanks. My sensei bounces - sometimes. After watching a while, I realized that he seems to do it when he's not actually worried about an opponent and is doing something to keep himself focused on the match. I've always found it reassuring that he never bounces when sparring me. It means I'm either worth worrying about, or at least not boring. Most Taekwondo stylists are infected with that darn bounce. That is one habit I did not pick up and was constantly corrected for not doing it. Even in a sport setting it was just one more thing that slowed an already slow Bob down! It also burns an awful lot of energy and when you are 40 trying to spar with folks half your age you need all the energy you can get! You can see how the bounce fits with boxing: Boxers don't have to worry about being kicked or taken to to the mat. Funny thing but in Kung Fu I'm dealing with the exact opposite: Everything is about staying grounded. Now I'm being corrected for not being grounded enough! I'm really fascinated with the almost unanimous aversion to bouncing when sparring from all the above commentators. In Shukokai karate we are taught to bounce! We adopt the 45 degree position and then keep up on the balls of the feet and bounce back and forth - the aim to be light on the feet and be able to move about quickly and change direction frequently. I agree it's exhausting but don't you risk being a sitting duck if you don't move around? Clearly when you want to throw a kick or punch you ground your feet first but soon as you've made your move you get back on your toes and move quick to avoid a counter strike. Maybe different sparring styles require different stances. In Shukokai we do non-contact sparring. Sue - my first sensei (not the bouncing one) would sometimes have us practice bouncing in order to get us used to being light on our feet and mobile - but in an actual fight or match, we were supposed to do it without the actual bounce. The visible bounce is too easy to time - it actually (in my experience anyway) makes it easier to wrong-foot your opponent, because you can tell which way his weight is going. I will assume considering the topic and the comments that everyone is referring to "Sport Karate". In self-defense/combat along with the title traditional/classical fighting arts no one has the time to sit and contemplate anything much less spend time bouncing while supposedly sizing up your opponent. In self-defense you are in and out of the conflict in a manner of minutes. Bouncing is such a waste. Energy loss is a big part for sport and in sport you should be quietly standing or sitting observing opponents for their rhythm. The bouncers should be a good indication of someone who is focused on bouncing and not their opponent while assuming the few techniques they know and use in sport will carry the day. Those of you who are quiet and waiting ready to use the appropriate techniques will prevail. I have a requirement that one practice stances after the primary singular basic until the stance become second nature along with breaking the forward backward motion most if not all sport karate uses. If you constantly move off the others center of attack you keep them constantly trying to regain that center allowing you to drop the hammer. This is all done before ever learning kata which we don't have room for here. I also don't allow anyone to just learn one or two techinques for sport but learn everything possible which takes time, etc. mmmm..... I'm going to have to think about this one. I think I'll discuss it with my sensei - he clearly expects me to bounce, whereas you all think it's a bad idea!